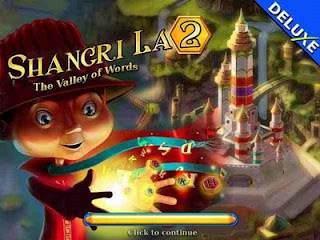 Enter a paradise of word game fun with Shangri La Deluxe. In this unique challenge, remove letter tiles from the screen by forming words. As you solve each puzzle, you'll unlock new doors and new challenges. Featuring a delightful storyline, 100 brain-bending levels, and gorgeous full screen graphics, Shangri La Deluxe is a wonderful addition to any word gamers library. Follow the trail along the Valley of Words and find the hidden city in the word game Shangri La 2 deluxe. Create the longest words possible and unlock 9 secret Seal Chests. Remove letter tiles from the screen by forming words. Each puzzle brings you closer to the legendary golden seals of Shangri La and the magical city. Featuring more than 100 levels, an original storyline, and more all-new features, 'Shangri La 2' is an exciting trip to a mystical land full of word game fun!